In the end, multitasking may be making you more busy than ever. As a working mother of two busy boys naturally I'm great at multitasking. I get up for the day. The moment I'm up -- I'm thinking about what I have to do today, what I have to do tomorrow and what I need to do at the end of the month. At the same time I'm applying my make-up, doing my hair and yelling at my boys to get dressed. Still, while trying to curl my hair, I'm checking my emails for anything that might be important. Plus I'm thinking about what the boys want in their lunch for school, how long it's going to take to drive to gymnastics and reminding myself that I need to buy a gift for the birthday party this weekend. Almost done my hair and make-up, I start to brush my teeth. At the same time I'm yelling at my boys to see if they're dressed and ready to go down stairs to have breakfast. All this in 30 minutes. Phew... I'm exhausted and it's only 7:30 a.m. What is the rest of my day looking like? I've always taken pride in being a good multitasker. But, is there really such a thing? Are we good at multitasking, or have we just trained our brains to think that way? I'm beginning to think that boasting my skills as a good multitasker may only be damaging my ability to get things done. I was asked to attend a Mindful Training session through The Potential Project. Dorota Ulkowska, Senior Trainer with The Potential Project explains, "Science has shown us that our brain cannot focus on more than one task a time. Keep in mind, this refers to analytical thinking. Therefore, having a conversation while putting on make up is still something we can do because the makeup application is not analytical. What our brain does when we “multitask” is that it switches from one focus point to another. Our brains do this so quickly that we identify it as multitasking. However, as we are switching back and forth between focal points, we actually are using up more energy, making more mistakes, loosing the oversight of what is truly important, and we actually end up doing all those things longer than we would have if we separated the tasks out." What I walked away with was knowing that not only am I bad at multitasking, but by multitasking I'm only making situations work. In this training session we were asked to do a multitasking test. The results were staggering. It took me twice as long to complete the test, making me less efficient. I had less focus and was stressed out trying to do my best. The quality was reduced and I made more mistakes. Most of all, after competing the multitasking test, it drained my energy. I literally felt a heaviness in my shoulders and chest. I was also annoyed that I couldn't complete the task well. In the first task you need to focus on write out the words "I am a great multitasker." Time yourself. Don't rush. Do it as you would normally write that sentence and then the numbers. Ready, set, go! Once you're done, write down the time it took to finish this task. Next, you will write the same sentence on the third line. However, after each letter in the sentence write the same numbers as before on the forth line. Do this in sequence from letter to number, letter to number, letter to number, etc. It will flow like this - with each task on one line; the sentence on top and the numbers below. How did you feel? Was your energy drained? Hard right? I'll be honest, I was mad that I wasn't good at multitasking. But now I get it! We've been conditioned to think that we NEED to multitask. We live in a culture that expects it. In actual fact, by multitasking we are working less efficient. We're actually getting less done. And the more you multitask, the more you train your brain to multitask. We're creating bad habits. Here's the challenge. How do I do this? How can I apply mindful thoughts to my everyday life. Here's how The Potential Project suggests putting mindfulness into action. Focus on what you choose. At the end of the day, every thought and action we do is our choice. We can choose on what we want to focus on. The first thing we need to do is to get rid of the distractions. Choose the environment you want to work in. Some distractions while you're working can be: email notifications, social media, or office chatter. You can choose to rid yourself of notifications, social media pop ups and the environment you work in. In some cases you can't always choose where you work and how people chat around you, however you can chose not to engage in the conversation. Rejuvenate your office space. Clear your own clutter. Choose your distractions mindfully. Obviously some distractions can not be helped. And example is: Your boss comes into your office and says I need you in my office immediately! Do you ignore the boss? Probably not. So you need to be mindful of what distractions can't be avoided. This is a start. There's so much more to being mindful. Having thoughts pop in your head is normal, but if we can remember to focus, we would be able to achieve so much more. This is certainly a challenge I put out to myself. I'm going to focus on being more mindful. What I didn't find was the statistics on how much time is spent on taking the kids to their activities, cooking meals and sleeping. I'm assuming it's mixed in with the childcare, housework and leisure time. In that case, add a few more hours in to the 2 hours for sleeping. 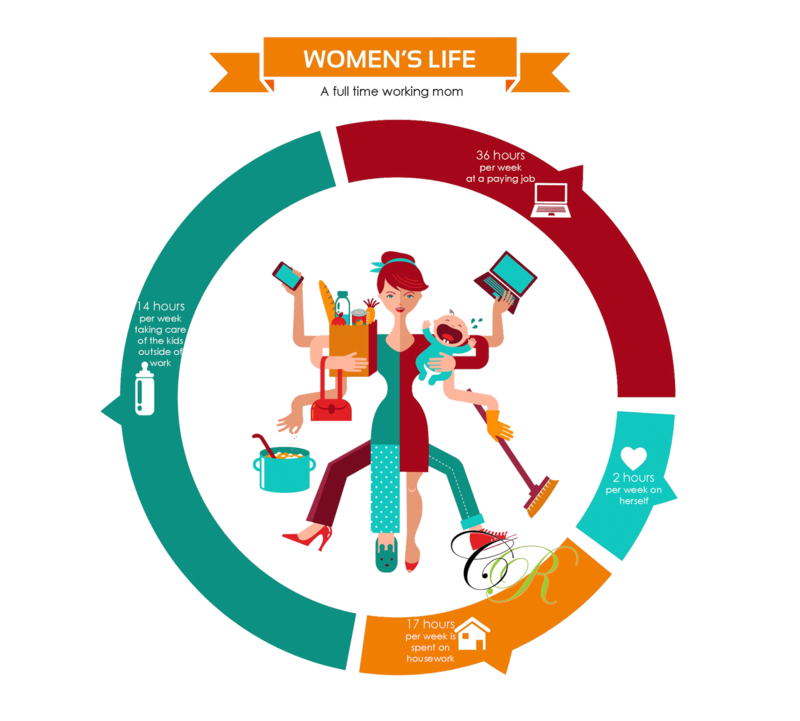 *On a weekly basis, mothers on average spend 17 hours in housework and 14 hours in child care. *On average, working mothers spend 36 hours per week in paid work. Radio Announcer, Business Owner, Magazine Editor, Blogger, Photographer, Mother, Wife, Sister, Daughter and... Part Time Cook (only when she has time). Looking for The Brighter Side of life sharing Good News, Great Ideas & Amazing People. Sitting still is something Christina knows nothing about. If you have a story to share feel free to contact Christina. Follow on Twitter, @BrighterSideyyc @RadioChristina @BBEmpower, and LIKE on Facebook The Brighter Side and ChristinaRowsell.com.